As the dust settles on a stellar 2018 World Cup in Russia, Fox Sports has a chance to look back at the operations of the massive event. Many pieces of the production puzzle were important to make the telecasts of each game a success, but data management was of the utmost importance. Reporting on Fox’s data-management efforts for the 2018 FIFA World Cup were (from left) Adam Hall, Reed Kaufman, Dustin Myers, and David Sobel. Fox Sports’ data-management team — Executive Director, Broadcast Data Network Infrastructure, Adam Hall; Executive Director, Post Production, Reed Kaufman; SVP, Production Operations, Dustin Myers; and Senior Director, Media Management, David Sobel — stopped by last week’s SVG Sports Content Management & Storage Forum to discuss the workflows deployed. With the tournament taking place thousands of miles from Fox’s broadcast center in Los Angeles, transmission between L.A. and its onsite operation in Moscow proved a major challenge. Copious amounts of data were ingested — 29,000 clips, 22,600 assets, nearly 2,000 live feeds, 1,300 show elements, and 1.9 PB of content — from 10 stadiums, 32 sites, and three media locations (postproduction in L.A., studio set in Red Square, and the onsite operation at the IBC). The data needed to be processed efficiently and quickly. The learning curve helped overcome the obstacle of securing a stable yet protected connection. To ensure that the operation was firing on all cylinders, Hall decided to replicate the current conditions in Russia and practice in the expected environment. Despite the stressful task of developing a method for processing large chunks of data while also seeing a quick turnaround for on-air use, Fox and its chosen vendors established a successful workflow. 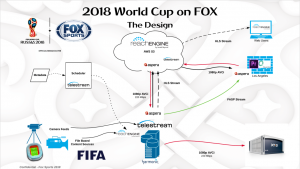 Fox Sports’ workflow for handling FIFA World Cup data between Russia and its Los Angeles broadcast center. With a hard-drive–free workflow, Fox could run an agile and free-roaming system without restraints. Plus, the cloud allowed a minimalist approach to packing the necessary equipment. 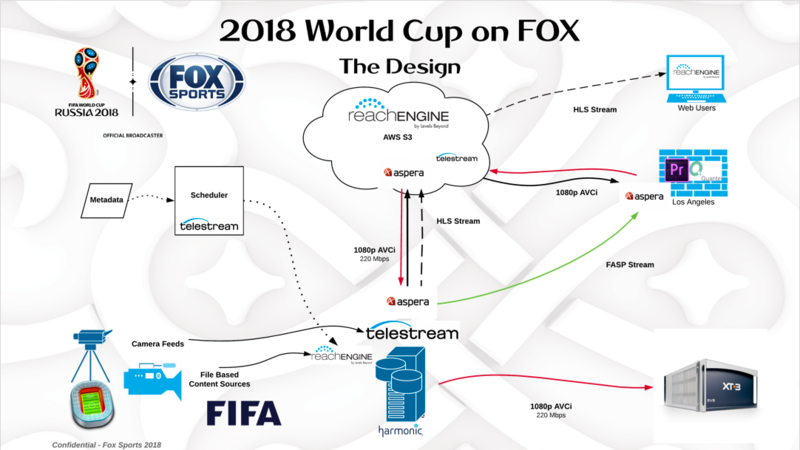 Looking back on the experience of producing the World Cup for the first time, Fox is eager to deploy this workflow for other projects, including the NFL and college football. 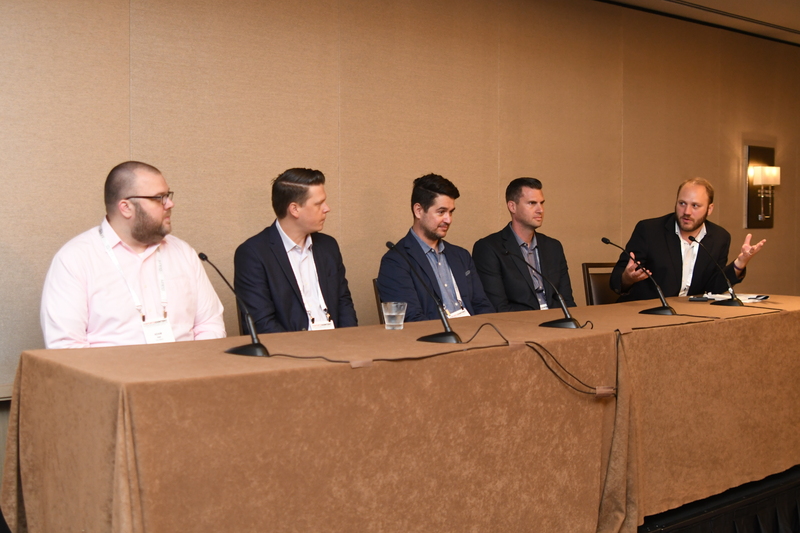 CLICK HERE for more in-depth reports, video interviews, and photos from the 2018 Sports Content Management and Storage Forum.